The best way to get around on our island is by motorcycle. The island is filled with taxi drivers that use these motorcycles. 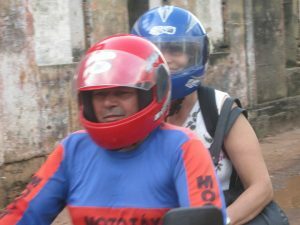 Unfortunately ninety percent of the drivers here do not have a license or a registered motorcycle. This is not a problem on a normal day. My taxi driver pick me up this morning to catch a boat into the city. On the way he got word from a passing cyclist that there was a police check point in the center of the island. They come out several times a year to make sure all the drives have current documents. He stopped and said sorry I can not get you any further, my documents are not up to date. That ended my trip into the city because my chance to find a legal driver is almost non existent. It is so bad that the city came out to contract 30 motorcycle taxi drivers to drive exclusive for the city and its employees. I am sure this would be lucrative contract. Only 12 drivers applied who could meet the requirement of having current documents. There are over 200 taxi drivers on the island, which means the chance of me finding one of the 12, impossible! So I am back in the my office writing this blog article about life on the island of Cotijuba. The testimony of George is an interesting one. Pastor Jeu impressed him because he sounded like a preacher he knew as a youth. He has been to a number of churches over time and all of them lie. The best example he could remember is at one church he dropped in and the preacher healed a man in front of the congregation. George knew this man and talk to him afterwards. George said there was nothing wrong with you. Your a very healthy person. What then did the preacher heal you of? The man responded, nothing. The preacher had paid him some money to pretend to be sick and then healed. So George saw all this religion stuff as a lie and a con to just get money from the people. When he saw Jeu and heard what Jeu had to say, it reminded him of a preacher he was impressed by as a youth, Missionary Bill Burk. At that time George had no reason to have religion but Bill still made an impression on him. Now nearly 40 some odd years later Bill’s disciple Pastor Jeu has arrived with the same message. Only this time George sees his life coming to an end and is interested in the message of Christ. You might say God has perused George all his live. The message never changed but the Holy Spirit is drawing George to Jesus. Pray for him and his wife that they will soon take the step of belief in Christ. What a surprise to see all these green shirts in church on Monday morning. We have only been a way for a year and Luiz has started a new ministry at his church. Luiz is a pastor we have partnered with for most of our ministry and a strong supporter of our ministry on the island of Cotijuba. The school has three teachers and about thirty kids. The kids come from the local neighborhood. It is very common for a community to have a number of private schools in their area because the public school system is bad. Most Brazilians send their young kids to a private if they can afford it. This school is priced in the lower price range to attract kids from around the local neighborhood. The church is not making any profit off the school but using it as a outreach ministry. Please pray for this outreach. Luiz is hoping that as he meets each of the parents daily as they drop their kids off he will have an opportunity to build bridges into their lives. As we have asked you to pray, the Lord has been responding. It was a great surprise to get word of these three men who came out and visited with me. These are three key men in the Brazilian convention of churches that I network with. They spent all day talking with me about partnerships. The leadership of our Brazilian churches are starting to come on board with this concept that the island of Cotijuba as a gateway to river ministry on the Amazon Delta. In the past they have used the phrase “it is not strategic for us and the ministries we support”. Now that Pastor Jeu has been out here for a year, there is a renewed interest in river ministry. They ended all their river ministry thrusts about six years ago. There is a desire on their part to have their youth mobilized for missions and ministry. In the past they have sent their youth out on the river to participate on short term ministry jaunts. These have been a failure for the most part. The youth have no training and the experience is overwhelming for them. One of the ideas they would like to discuss in more detail is the possibility of send some of their youth out to my place. We can provide them with some training and experience in river ministry. Then at a later opportunity they could be integrated into other river ministry efforts. Pray for these further conversations with these men. The river is wide and the water is deep. Which means we need many labors to reach the estimated 30 to 50 thousand communities where the Gospel message has yet to even arrive. Pray for the Lord to raise up ten youth to learn how to reach the lost on the river in 2016. Andre is now located in the city of Macapa, which is on the other side of the river to us. He flew over for a visit last Friday. It was a great opportunity to see what the Lord has be doing in his life. If you remember Andre was our volunteer church planter who spent a year in a small river community. He had some success at opening a hand full of homes in this closed river community. His life has moved on and he has moved elsewhere. It was great to hear that my investment in his life is not lost. He is working at a bakery factory making cookie type products. He is continuing to study the Bible with people around him and has two students he teaches on a regular basis. At his new spot there is a GBC church near by so he is becoming involved with the leadership of that church also. So we are excited to see what God has been doing in his life. Please pray for Andre that the Holy Spirit continues to transform his life and that he can be a bright light and testimony for the Lord in his new home. This does mean that he will no longer be involved with our river ministry so also pray that the Lord raises up new labors to replace him. It was great to have the opportunity to catch up with Luiz one of our ministry partners. He is a pastor who I have worked with now for over 13 years. Luiz is one of the fruits of our ministry and now helps support the work on the Island of Cotijuba. One of the lessons he has learned from me is to build a prayer team to support the ministry the Lord called him to. In this effort he has recruited 15 individuals to pray for his ministry on a daily basis at different hours of the day. His goal is to people lifting up his ministry 24 hours a day. I would encourage you today to join us in pray for Luiz ministry. He has a youth music ministry that needs prayer. This ministry is an open door ministry to the local community. He invites youth to come a learn how to play a musical instrument. The songs they learn are modern Christian songs and they includes a time of studying the bible. They have also started a school for young children from the neighborhood. There are three teachers and about thirty kids that attend. Please pray that this school will open door to families homes to hear the gospel message. If you can this week please pray for Luiz and his ministry. Last week was a very busy week for me. The prep for a meeting with the Directors of the Brazilian National Church, CNIEIB, went well. I was able to get my documents written in Portuguese for the meeting and send them via facebook. I do not have a printer yet so this seemed to be the most piratical method to reach these folks. This is a picture of most of the people attending the meeting. It was a difficult meeting for me because I was the one answering question for the two hours. They were all good question, but I did not have all the answers. The good news is that we are on our way to develop a partnership to reach the island of Cotijuba and the surrounding islands. My goal is to develop a joint ministry effort with the Brazilian National church to join us in reaching the river people near us. I am looking for them to approve Pastor Jeu to work as part of our church planting team. For the past year Jeu & Ester lived in our house, expanding the ministry here. We would like to see his work continue. Unfortunately the Directors desire the national church to vote on this matter at their next convention, January 2017. Please keep this effort in your prayers as we seek God’s wisdom in the matter. It was a thirteen month trip away from Brazil and my dogs. They are big and scary, they terrify a lot of people including the family that stayed in our home. We arrived at the gate at night and the dogs went crazy. They where so excited to see me that they would hardly let me in the gate. All were surprised that the dogs even remembered us. They family that lived in our stead had only been out of the house for a few days and were already missing the dogs. Ester expressed that she was terrified of these beast. Yet they loved on her and she broke down. The dogs are named Tuffy and Isabella. For the first few days Isabella was not eating her dry dog food, which is what I normally feed them. Ester had left some beans and rice in the fridge that we did not eat. When I added that to the dog good Isabella gobbled it up. It seems that she was giving them special food and spoiling them. It is better to have healthy spoiled dogs then the alternative. I just have to retrain them. Isabella has developed some health issues while we were away. We can not take our dogs to see a vet because it is to hard to transport them to the city. Pray that the Lord will give us wisdom in treating her. It is such a blessing of the Lord to see the kid club continues. It has many of the same kids when we ran the kids club over a year ago. Many of them have grown and they have heard the Bible Stories many times but still adore them. They play games, sing songs, draw a pictures and listen to a Bible story. Ester & Jeu have been helping the Johnsons with the kids club. Ester’s major role was to play the guitar for song time. Kim and Ester shared telling the Bible stories and Dave would run the games. Now we that have returned Jeu & Ester will no longer be able to continue in this role. They have been pulled back to his work as a pastor at the Monkey Island church. In the short term the Johnson family will be operating the kids club. Pray for the kids club. That it will build a foundation in these kids lives as we seek for them and their families to come to Christ.